Malta is also a popular shopping holiday destination. Although it is a small Island, Malta provides various shops both for the casual shopping that travellers do and also for the serious shopaholics. Shoppers that are looking for a bargain might probably visit Sliema (or Valletta). The latest and largest shopping mall is also found in Sliema, ‘The Point’ shopping complex at Tigne’ Point. This is a world class retail centre and is located in a pedestrianised multi-purpose development area in Sliema, incorporating some 260 luxurious apartments and penthouses. The whole area covers over 14,000 square metres of retail and leisure. In this area one is also able to find some of the most luxurious resorts on the Island. St. Julian’s is not as famous for shopping as it is for nightlife, however it is building a reputation for itself. This is because a lot of designer shops are opening in this location, the area around Portomaso is the place for you if it’s design brands you crave. Here you can find shops like Hugo Boss, Roberto Cavalli, Ralph Lauren, and various Italian international brand shops. In St. Julian’s you can also find Bay Street Shopping complex which is full of international branded shops, from Tommy Hilfiger and French Connection to Eurosport. This shopping complex opens every day from 10am till 10pm. 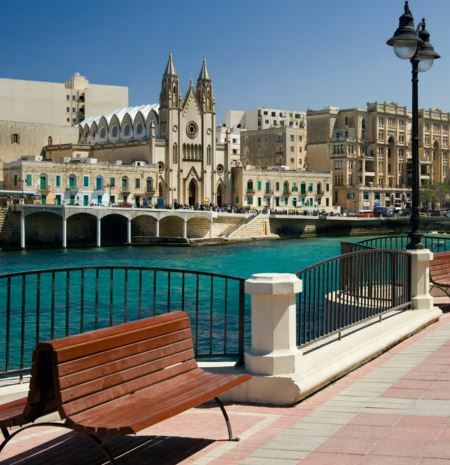 Another city which is also famous with shopaholics is Valletta, the capital city of Malta. One can easily spend a whole day shopping in Valletta as there are various streets entirely full of retail outlets, as well as restaurants and cafeterias where one can stop for lunch and dinner. Valletta is also well known for international shopping outlets. The capital city is at the moment undergoing various restorations that will be completed by mid-2014. The main restorations include, a new city gate entrance, a new parliament, a restored open-air theatre and also restored pedestrian streets, all of which will prepare Valletta for being the European Capital of Culture in 2018. Gozo is a very tranquil location, so if you are just after shopping, Gozo is not your place. Having said that one can still find branded shops in two main shopping arcades in Gozo. One of them is Arkadia, the other one is the Dukes. Both shopping complexes are in Rabat (the capital city of Gozo) and they are just opposite each other. Also in Gozo one can find international chain shops like Lidl and Mc Donalds. Another type of niche shopping in Malta is that of craft shopping. Malta offers various craft villages that showcase handmade products made of glass, wood and metal. Ta’Qali Crafts Village is the most popular crafts village in Malta. Ta’ Qali can be found near Mdina and Rabat where one has the opportunity to watch craftsmen blowing and forming glass, purchase handmade jewellery and also admire sculptures and lace. If one is visiting Gozo and has some spare time, it is a must to visit Ta’ Dbiegi Crafts Village’ which is located in the oldest village of Gozo, Gharb. At this site one can see hand-made pottery, glass blowing and leather items as well as Gozo lace. This place is not only ideal to buy the perfect souvenir but also to experience demonstrations of how unique items are created with great passion and talent. If someone wants to experience some traditional shopping one can visit Marsaxlokk, a fishing village in the south of Malta. The best day to visit is on a Sunday morning, where one can experience the Sunday market and also buy local fresh fish and other sea food products caught locally by Maltese fishermen. There are other open air markets where one can shop for cheap clothes and accessories. These markets can be found in various localities such as Birkirkara, Victoria Gozo, Rabat, Qormi, and also Mosta market. Ta’ Qali open market is ideal if someone wants to buy local produce such as vegetables, honey, and other local home-made food. Ta’ Qali area is also a well-known area for recreational activities.